For starters, the neck was warped and twisted and required a re-set. The body's original Fireglo finish was lifting and flaking in some areas, and water had stained areas of the maple with black streaks under the Fireglo finish. The fretboard was also seriously discolored, as the frets had oxidized and blackened the wood in a few areas. The poured pearl fret markers were beginning to lift, the tuners and pickup covers were corroded, and we later discovered that the bridge pickup was dead and the pots were scratchy from being water-soaked. 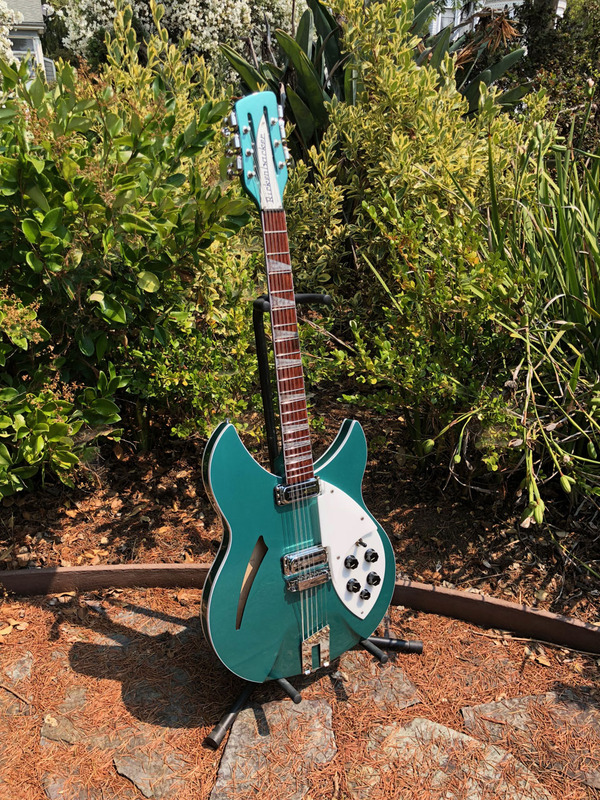 After consultation with the guitar's new owner who had sent it in to us for the work, it was decided that the refinish would be in Rickenbacker's wonderful, jewel-like Turquoise pearlescent finish. Over the past couple of years, we've had great success in adding a lamination of woven carbon fiber to the necks of our Rickenbacker and Madeleine Strings 12-string acoustic guitars, and also have used this on 5- and 8-string bass restorations. The laminate stiffens the neck to remain straight against the 30- pounds-plus pull of the strings when tuned to concert pitch. This was to be the first Rickenbacker electric 12-string to receive this laminate addition. Upon setting up the guitar post-resurrection and tuning the strings to pitch, an amazing side-effect of the laminate-sandwiched neck became obvious: the guitar had gained quite noticeably in both resonance and sustain, and its "jangle" became much more pronounced than is typical of this model, too! TURQUOISE IS A FAVORITE RICKENBACKER CUSTOM COLOR!